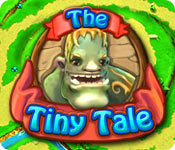 The Tiny Tale is rated 3.9 out of 5 by 42. Rated 5 out of 5 by Bumbles2 from Cute story line and a great way to relax I kind of liked this little game to begin with when I played the demo...so I bought it...end of story??? Not quite...LOL I found that I could actually relax while playing...and what a wonderful time I had playing this TM game!!! This game is about some cute little gremlins and their Shaman boss travelling through the various levels to retrieve the 4 elements...earth...wind...fire and air from an evil wizard who stole them...I really enjoyed some of the hilarious comments made by these toons. And the story was easy to follow. The graphics were wonderful and well put together...but I did find the music was a bit repetitive and so I fixed that issue by turning the volume down...other than that this game was a joy to play. I've already shared this with my Grand-kids and they played it with ease. Anyways...I think you'll probably enjoy this as much as me and my G-kids do. Play safe and have fun guys !!! Rated 5 out of 5 by keldra1024 from entertaining goblins the sound effects and animations of the goblins were very entertaining. I wish the game had a option for "relaxed" mode or something to turn off attacking spiders and giants--for me, those made some levels too challenging. Rated 5 out of 5 by Spoiled2 from Love being able to challenge the Developers times! Didn't finish this one in one night for a change. It took a few weeks to beat all the Developers times! I hope there will be a 2nd one soon. Rated 5 out of 5 by tutortime from Loved this game. I love this type of game. Beautiful graphics and challenging levels. The game lets you play at your own speed so you can take your time and have fun. Relaxing. Rated 5 out of 5 by leeisme from excellent this is the kind of time management games I wait for - great job. Trust me play a level several times- try to beat your own score. I've been able to beat the developers own score quite a few times, that always feels great! Rated 5 out of 5 by njewer from Fun!! I am just loving this game....at level 12 so far, have all red flowers but the strategy can be pretty tricky sometimes. It also lets you play on for "lower" flowers and has a casual mode as well. I love my troll and my little gremlins - love the new outfits I keep winning for them to wear - doesn't affect gameplay but they sure are cute!! I don't play hidden object games any more - got burnt out on those. Only play builders, strategy, TM games and they seem to few and far between - especially the good ones. In my opinion, this one is very good. Just finished Royal Envoy and Rush for Gold and am enjoying this one every bit as much. I've read that some felt it was too short but I am finding it increasingly difficult to get the red flowers and I think this will take me quite awhile. I guess if I was just doing the levels it would be shorter....It has everything you could want - relaxed mode, challenge mode, you can queue tasks - AND it is very cute and funny!! Give it a try - I know there are many TM lovers out there that would just love this!!! Rated 5 out of 5 by SilverBranch from More entertaining than most resource build games I'm rather sick of those cookie cutter "collect stone, gold and wood" time management games but always try the new ones in hopes of finding something different. This game isn't very different, but where it kept my interest was in its graphics and theme. The gremlins are pretty cute and the shaman troll is so funny when he dances on the altars. So was it ground breaking in its variety? No, but I did enjoy it enough to buy it. I refute that its too short - its has a standard amount of levels. If you're a perfectionist going for all gold and have a day job so you can't sit a solid 4-6 hours at one game, then you'll find its a good length. Rated 5 out of 5 by BF_Missy from Hilarious! The characters in this game are just way to funny. What a fun twist on the building homes games, which I love. There are a few things that can be done to improve the convenience of the game, but these minor things didn't stop me from buying it the moment my trial period was over. There is no "Skip Tutorial" or "Skip the Conversations" feature. No option for replaying the game, you have to exit to the map and re-enter the game again. Nor is there a "Options" feature within the game, you have to keep exiting until you reach the main page. Sort of a pain when you're trying to lower the volume bcos those creatures mantra when picking food, does become grating on your ears. So you need to exit a few times to get it just right. The biggie is that the "cancel tasks" feature will not cancel the first task, only the other pre-selected tasks. On the upside, the game switches windows pretty fast so these little things are easy to fix and didn't bother me that much. Other than that, this game is a real hoot & that's why prompted me to buy it. Rated 5 out of 5 by bichy from Great Game This game will give me hours of fun with great game play of both time management and strategy. Nice graphics, instructions are clear and the music is not annoying. It is not a walk in the park even on easy mode but I am having a ball playing as the goals are not unattainable - just need to try another tactic. I highly recommend this very cute game for everyone - it has made me think, laugh at the dialog and aww at the characters who are at times so ugly they are cute. Rated 5 out of 5 by gmac1007 from The One That Almost Didn't Make It Wow ! What a fun and cute game this is and to think this one almost didn't make it here due to the graphics, are you kidding me ?! What a shame it would have been for this one not to get here because it is so fun and I'm so glad it got here. The graphics are really good very bright, and very detailed and this is just one fun and awesome little builder game and the longer I play it the better it gets. Your building with gremlins and an ancient shaman who is their boss and this is something different for us and I love it. The little gremlins are really cute and I love to hear them talk it's a hoot ! 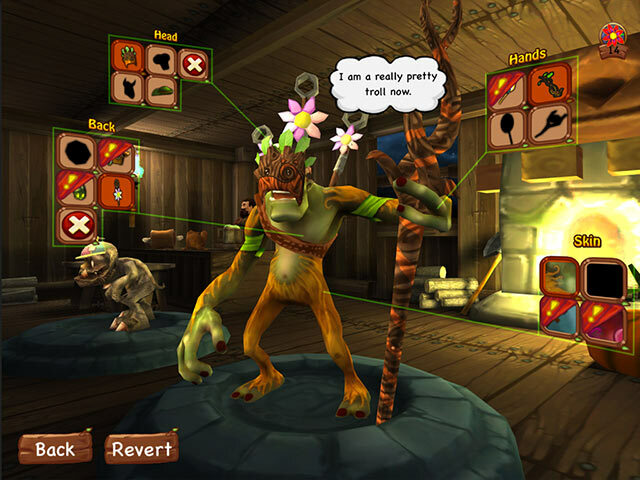 This is a builder on the same lines of Northern Tales and the other builder games. 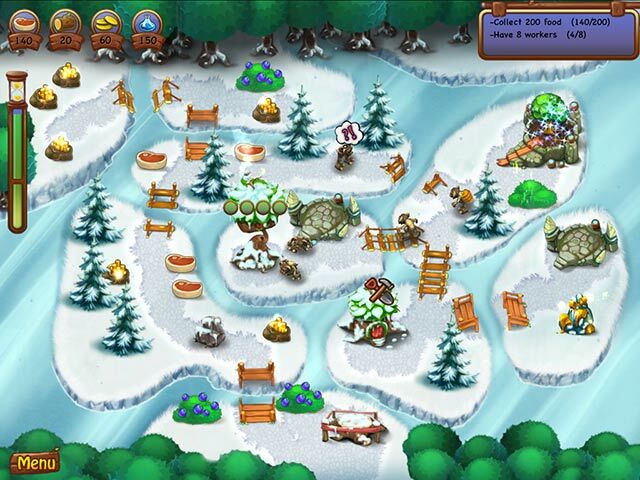 You clear obstacles out of your way, gather resources, build different types of buildings and fight of enemies. There are two modes of play relaxed and normal with the relaxed mode you can continue to play after the timer runs out with normal mode if you run out of time you have to repeat it to move on to the next level and with both if your not happy with what you did the first time you can replay it. Your not collecting stars with this one it's flowers and the flowers you collect you can go to a little shop and dress your workers which I thought was really cute and fun but you don't have to do it if you don't want to. This one offers a good challenge and you need to do some planning on some levels and before you start a level you can press and hold down your space bar on your keyboard and it will highlight which task are ready for you to do and they will be in a green circle but if there is any red in the circle you have to wait and do that one when you have more resources or workers. The shaman can cast spells to help you out like harvesting food faster, giving you some extra speed and fighting off enemies. This is really a awesome little game and kudos to the dev's for doing this one you did a awesome job on it and I hope we'll see more like this from you. Give the demo a try it's so very worth it ! Thank you dev's for this sweet little gem and thank you Big Fish. Have fun everybody. 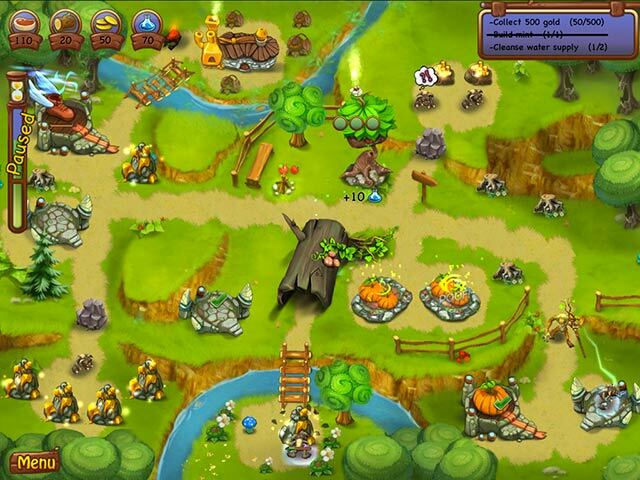 Retrieve the four magical elements and restore the kingdom in this mystical Time Management game!